A Notice of Violation can be issued as a result of a filed complaint, on the basis of a periodic inspection, or from permit review. If violations are found during an inspection to verify a complaint, during a periodic inspection, or after review of permit applications and histories, a written Notice of Violation is prepared by an Inspector and sent to the property owner or agent. When all corrective work must be completed. The time frame for filing the permit(s), and completing all permitted work. Whether investigative fees will be applied for work done without the requisite permit. Which Inspector must be contacted by the property owner/ agent to schedule inspections as the corrective work progresses and is completed. ​Should the cited owner continue to fail to abate the violation(s), they will be sent to a Director’s Hearing to come before a Hearing Officer and explain why they haven’t complied. An assessment of costs, accounting for the time our inspectors spent on getting the property owner to comply will be applied to the property. All required corrective work is completed as verified through a final inspection by the pertinent division inspectors. 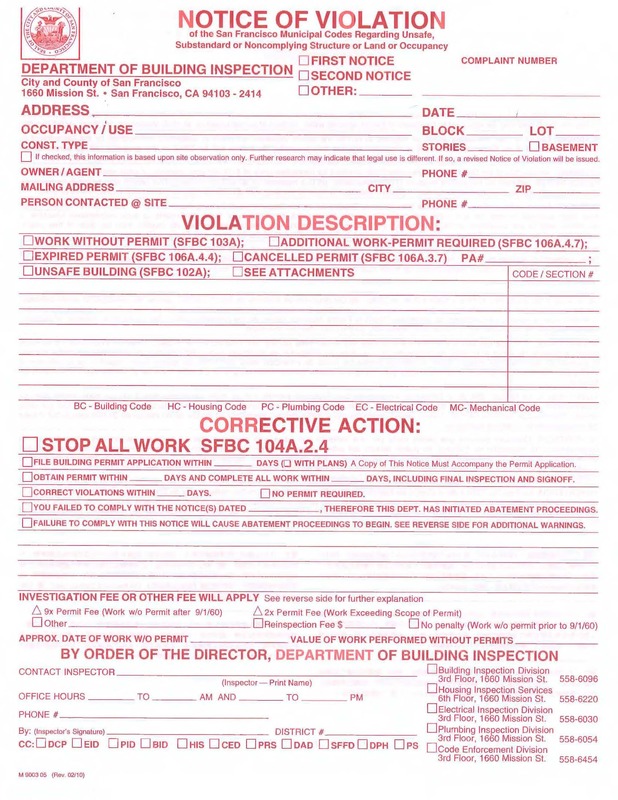 Required permits are issued and completed, as verified by a final inspection by the appropriate division inspector in which the permit job card is signed-off indicating all work is completed. All assessment of costs, reinspection fees, penalties or any other applicable code enforcement fees are paid. All documents necessary to revoke any pertinent Orders of Abatement are recorded. All related complaints on file in the Department’s Complaint Tracking System are “abated”. Read more about the code enforcement process.